Introducing River, Pepper, and Roxy. A dog’s story starts with its breed – let’s see what Embark can tell us! Pepper is a beautiful Labradoodle. Starting with your dog, Embark unfolds a story that started over 15,000 years ago when dog and human became friends. There are over 250 unique dog breeds. And while we know all dogs are related, some are more closely related than others. The Labrador Retriever breed was bred for hunting and excelled in retrieving game after it was shot down. Known for its gentle disposition and loyalty, the Labrador Retriever has become a favorite of families and breeders alike. Discover the closest genetic relatives to your dog – you may be in for a surprise! Did you know? Through DNA we have uncovered how dogs are related all the way back to wolves. Your dog has taken a long trip to get to your lap. Through Pepper’s Y-Chromosome we can trace his ancestry back to where dogs and humans first became friends. Each different ancient group – or haplogroup – tells a different story of creation, migration, struggle and ultimately survival. The most common lineage among American and European dog breeds is A1a, including the vast majority of iconic breeds such as German Shepherds and Golden Retrievers, as well as most Border Collies, Scottish Terriers, and Irish Wolfhounds. The A1a group is now widely distributed across Oceania and the New World, and frankly anywhere Europeans have gone adventuring and colonizing in the last 300 years. Though A1a is currently found in many village dogs, it is almost certainly indigenous to the villages of Europe. The Vizsla breed is a grand Central European hunting dog with a thousand year history; all Viszlas come from this lineage, suggesting that the first Viszlas were part of this lineage. While A1a male dogs would like to claim credit for having the best genes, the success of this lineage is probably based mostly on the recent successes of European civilization and colonization than any kind of natural selection. Through Pepper’s Mitochondrial DNA we can trace his ancestry as it relates to his mother. Mitochondrial DNA or mtDNA is inherited only from a dog’s mother. B1 is the second most common maternal lineage in breeds of European or American origin. It is the female line of the majority of Golden Retrievers, Basset Hounds, and Shih Tzus, and about half of Beagles, Pekingese and Toy Poodles. This lineage is also somewhat common among village dogs that carry distinct ancestry from these breeds. We know this is a result of B1 dogs being common amongst the European dogs that their conquering owners brought around the world, because nowhere on earth is it a very common lineage in village dogs. It even enables us to trace the path of (human) colonization: Because most Bichons are B1 and Bichons are popular in Spanish culture, B1 is now fairly common among village dogs in Latin America. River is a purebred Australian Shepherd. The Australian Shepherd, or Aussie, is the 17th most popular dog in the United States. Despite their name, the Australian Shepherd originated from the ranches of the United States around the 1800’s. They are praised by stockmen and breeders for their trainability and intelligence. The breed has considerable energy and usually needs a job to do to keep it entertained. Australian Shepherds are often employed as guide dogs, rescue dogs, and therapy dogs. They have a medium build and a wide variation of different coat colors. If an Aussie is bored they will often invent their own games or activities. They also thrive on close companionship. Aussies are at times called “Velcro Dogs” for their tendency to stay close to their owner. Through River’s Y-Chromosome we can trace his ancestry back to where dogs and humans first became friends. Each different ancient group – or haplogroup – tells a different story of creation, migration, struggle, and ultimately survival. For most of dog history, this haplogroup was probably quite rare. However, a couple hundred years ago it seems to have found its way into a prized male guard dog in Europe who had many offspring, including the ancestors of many European guard breeds such as Doberman Pinchers, St. Bernards, and Great Danes. Despite being rare, many of the most imposing dogs on Earth have it; strangely, so do many Pomeranians! Perhaps this explains why some Poms are so tough, acting like they’re ten times their actual size! This lineage is most commonly found in working dogs, in particular, guard dogs. With origins in Europe, it spread widely across other regions as Europeans took their dogs across the world. Through River’s Mitochondrial DNA we can trace his ancestry as it relates to his mother. Mitochondrial DNA, or mtDNA, is inherited only from a dog’s mother. Congratulations, C1 is a very exotic female lineage! It is more closely associated with maternal lineages found in wolves, foxes, and jackals than with other dog lineages. So it seems dogs in this group have a common male dog ancestor who, many thousands of years ago, mated with a female wolf! This is not a common lineage in any breed, though a good number of German Shepherds and Doberman Pinchers are C1. It is also found in breeds as diverse as Peruvian Inca Orchids and Pekingese; it is rarely found amongst Labrador Retrievers, Border Collies, Siberian Huskies, or Cocker Spaniels. Despite its fascinating origins, it is widely distributed around the globe, and even shows up frequently among Peruvian village dogs. It almost certainly survived at low frequency in Europe for millennia and then was dispersed outside of Europe by colonialism, though not as successfully as some other lineages. Roxy is a mysterious mutt. Bred initially in Northern Siberia, the Siberian Husky is a medium-sized working dog, quick and light on their feet and free and graceful in action. Their moderately compact and well furred body, erect ears and brush tail suggest their Northern heritage. Huskies are very active and energetic and are known for being long distance sled dogs. Through Roxy’s Y-Chromosome we can trace his ancestry back to where dogs and humans first became friends. Each different ancient group – or haplogroup – tells a different story of creation, migration, struggle and ultimately survival. F is the odd duck in the family of domestic dog male lineages. This paternal lineage is genetically closer to wolves, foxes, and jackals than to other dogs. This indicates that it came into the dog population after dogs were originally domesticated, when one particularly attractive male wolf mated with a female dog, over 6,000 years ago. Since then, these dogs found their way into Africa and Mongolia. It hasn’t been found outside those areas except in Basenjis. Basenjis are an iconic African breed, that first made its way to the USA in the early 20th century when a handful of individuals were imported from the Congo. The Basenji is an ancient breed which is distantly related to other dog breeds (most of which are European or Asian), and it has the earliest separation date from all other breed populations. Unsurprisingly, the F lineage has also been found in African village dogs, as well as, surprisingly, some samples from Mongolia. The fact the lineage is found in two very distant places is evidence that it entered the dog population many thousands of years ago. Through Roxy’s Mitochondrial DNA we can trace his ancestry as it relates to his mother. Mitochondrial DNA, or mtDNA is inherited only from a dog’s mother. A2 is a very ancient maternal line. Most likely it was one of the major female lines that contributed to the very first domesticated dogs in Central Asia about 15,000 years ago. 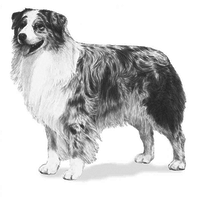 Some of the line stayed in Central Asia to the present day, and frequently appear as Tibetan Mastiffs and Akitas. Those that escaped the mountains of Central Asia sought out other cold spots, and are now found among Alaskan Malamutes and Siberian Huskies. This lineage is also occasionally found in several common Western breeds, such as German Shepherds and Labrador Retrievers. Curiously, all New Guinea Singing Dogs descend from this line. These are an ancient and very interesting breed found singing, not barking (warning: don’t listen to this if your dog is in the room! ), in the mountains of Papua New Guinea. Unfortunately, they are now endangered. They are closely related to the Australian dingo, so you could say its cousins are dingos! This line is also common in village dogs in Southeast and East Asia. Unlike many other lineages, A2 did not spread across the whole world, probably because it did not have the opportunity to hitch its wagon to European colonialism – or because these dogs just prefer hanging out in mountains, tundras, islands, and other hard-to-reach places!